During the Napoleonic Wars (1792-1815), French captives held in British prisons and ships produced bone and ivory ship models as both a recreational pastime and for financial gain. Their method of production was an intricate and laborious one, employing materials available to them such as left over bone from their staple diet of mutton stew, head hair, clothing and jewellery. It normally took a prisoner at least a few years to complete any one model. 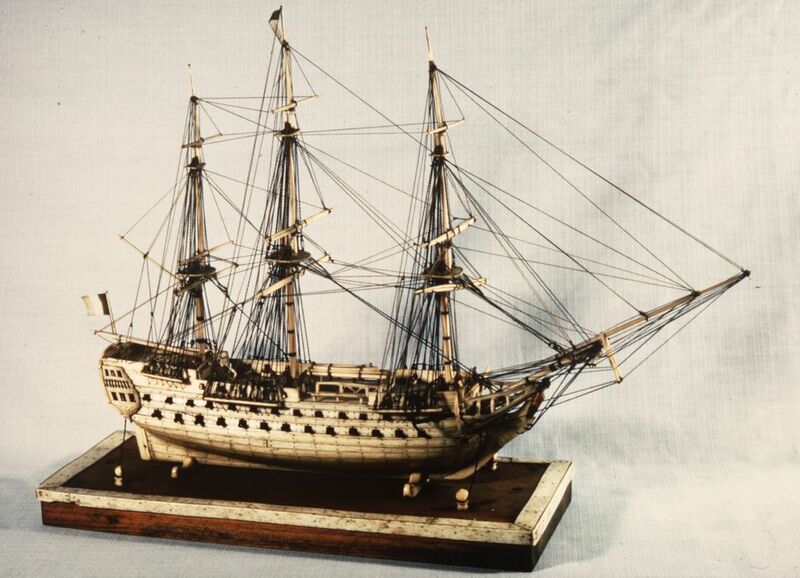 This ship model was probably made by a Napoleonic prisoner-of-war, c.1800. From 1792 to the Battle of Waterloo in 1815, the British were almost continuously at war with France (D. Moss "Fortunes of War" in Women's Journal, October 1985; p.208). During the drawn-out campaigns against Napoleon, about 100,000 French were captured. They were initially locked into the hulks of old ships moored at naval bases like Chatham and Portsmouth in England, but when these became overcrowded, many were moved to castles as far afield as Porchester and Edinburgh in Scotland (ibid. p.208). Eventually, special prisons had to be built. Among these were the Norman Cross near Peterborough and the Princeton on Dartmoor. Many of these prisoners were not 'ordinary', in the sense that they included artisans who would have almost undoubtedly been responsible for making ship models such as this one. The prisoner-of-war models (which also included decorative trinket boxes, toys and buttons) were produced from scratch under extremely difficult conditions. They did not use the aids of official draughts or plans and constructed the models out of either bone or wood. A common feature among prisoner-of-war models is the 'over engineering' of the vessel designs. In other words, elements such as studding sail booms were added onto the model, even though they were not necessarily present on the real thing. The process of construction of the bone ship models was intricate and complex. The prisoners obtained the bone from their staple meal of mutton stew (which came served with the bone) and made it pliable by submerging it in wet clay for prolonged periods. Bone models were usually constructed on the basis of a shaped hull or matrix, hollowed out down to main or orlop deck level and covered over with exquisitely formed little planks of bone secured with tiny copper rivets. Planking rivets and such features as mast-hoops, rudder-pintles and gudgeons and stunsail-boom 'irons' were made from gold beaten out (the gold would have come from the prisoner's earrings or finger rings) and fashioned to the correct shape. The rigging was made from fine silk and 'laid' into miniature rope with horsehair and human hair pressed into service. Despite the sheer craftsmanship and skill involved with the bone ship models, they still feature some inaccuracies. Apart from their 'over engineering', the underwater lines of the vessel were also usually misrepresented (appearing too fine); head timbers were distorted and compressed to an extraordinary degree; gun decks were occasionally compressed down too far and they were sometimes also overmasted. Other differentiations between ship models can be attributed to the involvement of many prisoners on one individual model. For instance, it was common that one man produced the hull, while another was responsible for the rigging and so forth. Thus, variations in the quality and level of detail could possibly be seen as a result of that individual's ability and knowledge. This ship model, while depicting 72 guns, most likely represents the French 74-gun, two-decker 'Le Heros' warship. The 'Le Heros' was built around 1770-1790. On April 16, 1781 it was present as one of the squadron in the Battle of Porto Praya (April 16, 1781), a naval battle which took place during the American Revolutionary War between the British and the French. On June 20, 1783 the 'Le Heros' was in action off Cuddalore and in the same year, came into conflict with the HMS 'Hannibal'. During the evacuation of Toulon in southern France in 1793, the 'Le Heros' was finally destroyed by Captain W. Sidney Smith. The identification of this model as the 'Le Heros' has been drawn from comparative analysis with two other ship models in international collections. The first of these, in Arlington Court, Devon, UK, bears exactly the same form to our model (except for the slight variation in the orientation of the stern post) and is documented in their records as being the 'Le Heros'. The second, held by the National Maritime Museum in London, also bears the exact same form, in addition to the name 'Le Heros' which is inscribed on the stern. This model has undergone some repair work since its production. From 1946-1949, Mr George Mott repaired and re-rigged it. He stripped the model down; washed the spars, tops and hull with soap and warm water; repaired the head rails, stern gallery and deck fittings and installed a new rudder and spars. He spent approximately 250 hours working on the model before returning it to the Museum. This particular model was presented to the Museum in 1939.